Ebates Reviews: Is Ebates a Scam or Can Your Really Get Paid to Shop? Ebates Review: Is Ebates a Scam or Can You Really Get Paid to Shop? What if I told you could make money online without ANY effort, just by shopping like you normally do, buying the things you normally buy? Sounds too good to be true, right? That’s what I thought at first when I heard about the cashback site, Ebates. Is Ebates a scam? Read on to find out if Ebates is a legitimate way to make money online. Before we get into the scam versus not scam question, let’s dive into what Ebates actually is. Ebates is a cashback website that started in California by two former deputy district attorneys. When it first started Ebates was much smaller, offering anywhere from 0% up to 25% cash back from around 40 online retailers. Since our founding in 1999, Ebates has helped its members — 10 million and counting — earn over $1 billion in Cash Back at their favorite stores. By connecting these savvy shoppers with America’s best brands, we give them a hassle-free way to save money on the things they buy every day, while our retail partners find loyal new customers and drive record sales. That’s how we’ve become one of the largest free-membership loyalty programs in the U.S., with an A+ rating from the Better Business Bureau. But what does that mean for you? What is this information telling you? Let’s read between the lines here a little bit. What stores can I shop with at Ebates? Little baby Ebates has grown up a lot since it’s startup days with only 40 online retailers. 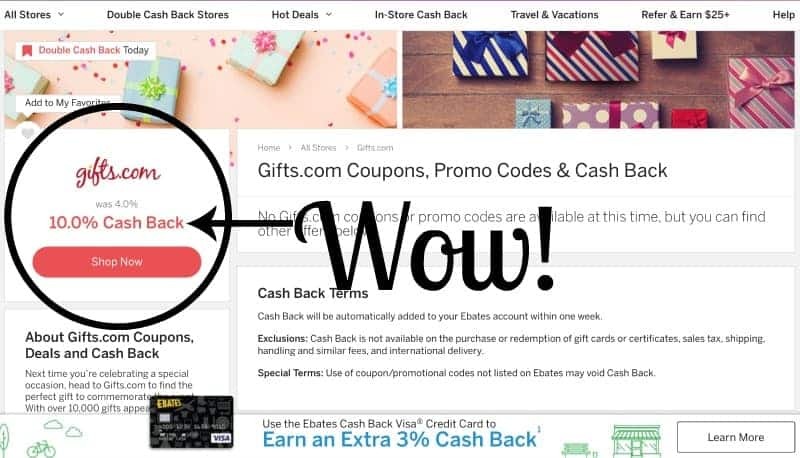 Today, Ebates offers it’s members fast cash back at over 2,500 online retailers, including Amazon, Macy’s, Walmart, Gymboree, Lowe’s, and many, many more. That means no matter who you are or what you are looking for you are probably going to be able to find it on Ebates! Ebates has partnered as an affiliate with over 2,500 companies to help customers save money. They basically are acting as a middleman to help both you and online retailers make money. Here’s how Ebates works. You, as a member, use Ebates to find great deals at the places that you want to shop and Ebates sends you to your destination through its member portal. As a thank you to Ebates, that company sends Ebates a percentage of what you spend at their store, which Ebates then splits with you! For example, let’s look at Gifts.com, which as of this writing is gearing up for Black Friday and the holiday season. It is currently offering Ebates members a whopping 10% cash back on their purchases! You can click on each company’s portal to see their offers in more detail. Right now the Gifts.com cashback percentage is up from 4% to its current 10% and the average person gets $19 back from their purchases from Gifts.com! Does Ebates cost you any money? NO! Ebates will not cost you any money, not for their membership and not for buying things online. You can only make money with Ebates. Ebates is FREE for everyone and they literally just give you money back for buying something that you were already planning to buy. You can even earn money back on top of other sales! 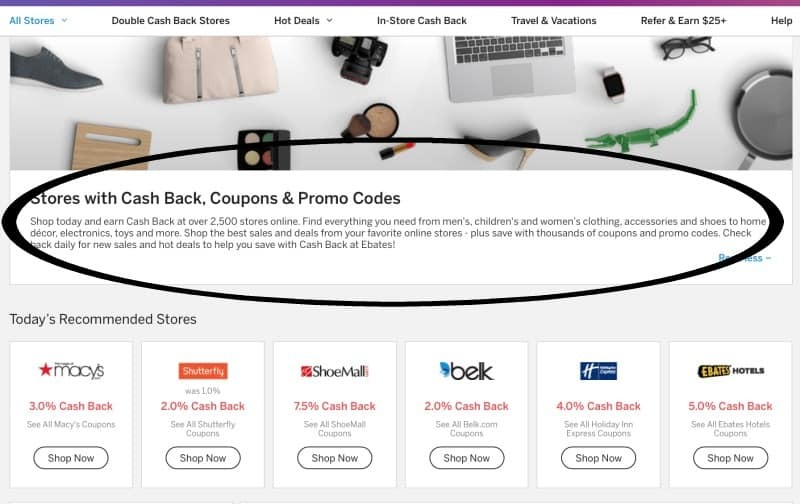 For example, if you were planning to buy something from Kohl’s and you have a coupon you can still use that coupon and you will earn cash back from Ebates on top of that coupon’s discount! What if the store is offering a 50% off sale? Same. The Ebates cash back offers money back on top of the normal discounts. It’s like icing on a cake. Tasty, easy, delicious icing made of dollar dollar bills. Yeah right, have you used it yourself? Yes, and I am a huge fan! My husband (who is the hardest person in the world to buy gifts for, by the way) recently told me he wanted a Fitbit as an early Christmas present. I was honestly ecstatic, because instead of having to try and guess what the heck he wanted, he flat out told me (and P.S., this is the man who has returned 9 years of Christmas presents because he wasn’t happy — even when he picked them out himself). Ok, husband wants a Fitbit, husband gets a Fitbit. So I logged into Ebates and checked to see if Fitbit was an Ebates affiliate and, BINGO!, they are! So I ordered the Fitbit, my husband was happy, and we got 4% cash back on our purchase! Not only that, right now Ebates is offering a $10 Welcome Cash Back bonus when you sign up to be a free Ebates member! The first step is to sign up for Ebates. Go to the Ebates website and click the “Join Now” button located in the upper right-hand hand corner. Once you have signed up and logged in, you will notice a lot of the various store names and their current cash back offers. If you don’t see the store you are looking for, you can type the name into the search engine and search for it that way. Going back to Gifts.com, if you go to the search engine and enter “gifts.com” right away you will see a drop-down selection for Gifts.com and that they are currently offering 10% cash back right now. Click through to the Gift.com link and at that point you will hit the “Shop Now” button in red to take you the actual website to start shopping. PLEASE NOTE! You should always log into Ebates prior to starting any shopping session, otherwise, you risk missing out on earning cash back! Once you click on the red “Shop Now” button, wait a moment and allow Ebates to direct you to your chosen website. DO NOT open a new window, otherwise, it will not track your purchase. Also, don’t save items in your cart and then go back to Ebates and re-enter to buy; you must FIRST enter via the Ebates portal and then add the items to your cart. Again, items in your cart prior to entering Ebates WILL NOT be included in your cash back purchase. What if you forget to shop through Ebates? I get it. Seriously. Like Jay-Z, you have ninety-nine problems right now and don’t want to make logging onto Ebates everytime you need to shop the final one. In that case, Ebates has really got your back. There are two ways that you can make sure that you never miss out on your cash back. Lucky for you, Ebates has a browser extension that you can install on your desktop browser. After you sign up for Ebates all you have to do is install this button on your desktop browser and every time you enter an Ebates-affiliated store, you will see a little popup notification that will prompt you to “Activate ___ Cash Back” at the top right-hand corner, just like it did for Walmart when I used a Google search to enter the Walmart website, instead of going through Ebates. PLEASE NOTE! This extension only works for desktop browsers; it will not work on your mobile phone! If you want to use your phone for shopping you should download the mobile app first. Also, certain stores don’t work with the browser extension (Amazon is the biggest one) and it does help to familiarize yourself with which ones do and do not. This information can be found on their website. Let’s say you make a purchase and — oopsie — you realize that it was from an Ebates qualified store and you could have gotten money back on your purchase! Don’t sweat it! 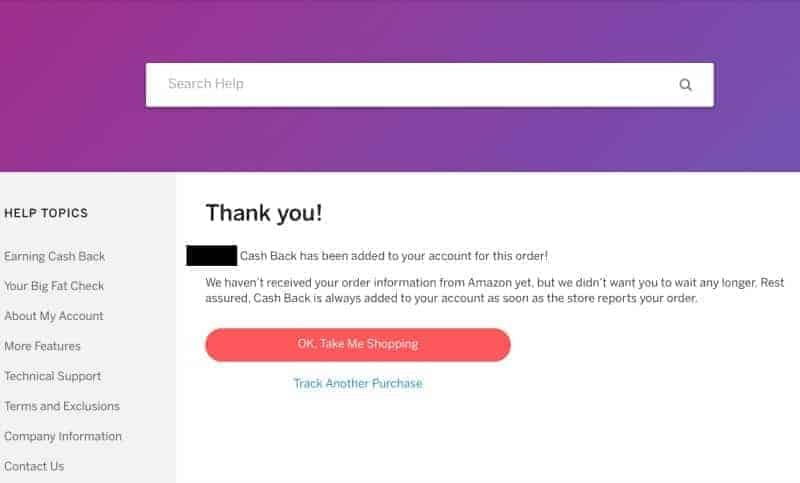 In that case, all you need is your confirmation email with your order number from the store that you purchased and you can log into the Ebates Help Center and submit a request for “Missing Cash Back”. I got an immediate confirmation stating that not only did they receive my request, but they also immediately refunded me so that I didn’t have to wait! I was super impressed by their service, to say the least. 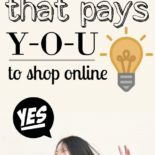 On top of saving money on your day-to-day shopping, Ebates also offers you other ways to make money. Right now until 12/31/2018, they have a special offer; if you refer someone to Ebates you can earn $25 yourself once they start buying things on Ebates! 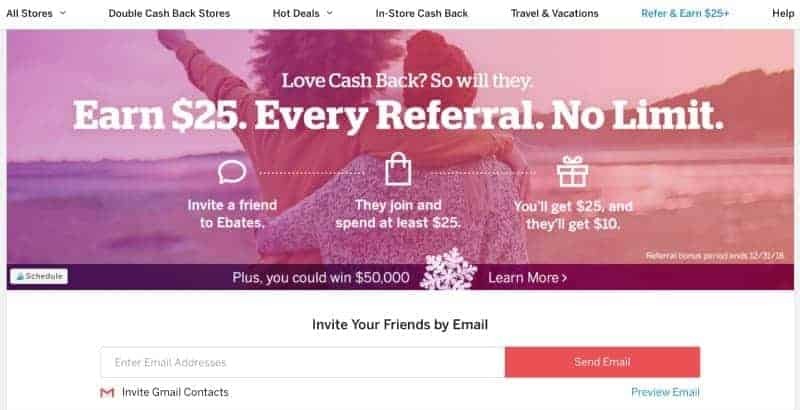 If you end up loving Ebates you can refer your friends and family to also start making money with Ebates and get a little cash back yourself for your referral. You don’t need a website, a business, nada — just email your friends or put them on blast on Facebook and you can earn a quick $25 if they sign up! Pretty epic, right? For every single person you refer that signs up to Ebates you get $25 back. Click here to sign up and start making money with Ebates today! No, Ebates is not a scam; it’s a totally legitimate way to make money — good money — online with no hassle, just doing the things you normally do. They have great cash back offers and excellent customer service which keeps them at an A+ ranking with the Better Business Bureau. ***Hot Ebates update: Black Friday and holiday shopping deals! 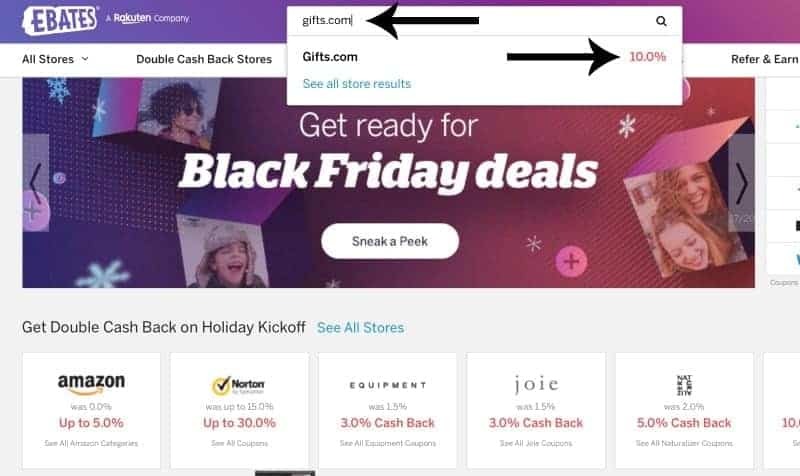 As I was writing this post I noticed that Ebates has already started gearing up for the holiday season by offering huge cash back incentives, like their Double Cash Back on Holiday Kickoff deal and Black Friday and Cyber Monday deals! If you sign up now you can get a sneak peek at participating Black Friday and Cyber Monday deals that will be dropping on 11/21/2018! If you start now you can plan ahead and find some great deals that will keep you ahead of the game for your holiday shopping! If you want to make money just by shopping online with very little effort, yes Ebates is worth it. I have had excellent experiences with Ebates and plan to do all my shopping through them in the future. I hope I can update this post further when I can report back all the money I saved by doing my holiday shopping with Ebates! Have any questions about Ebates that I didn’t answer? Leave me a comment below! I love Ebates. In fact, I was headed to check my balance then got distracted when I saw your post. So I guess you could say you are good for me. Yes! I absolutely love Ebates! I’m always hesitant when something like this is just sooo good! I know, it’s like this can’t be legit??? I was so impressed by how much I have made with Ebates! I LOVE EBates and have been using it for awhile. I can’t use it in addition to RewardStyle for my own purchases, tho, so that’s the only time I don’t use it. Oh that’s interesting! If I get accepted to RewardStyle I am going to ask you about that then.